CBR Reader is a simple, free and dedicated comic book viewer. It could open and read *.cbr files and has useful view options: Next Page, Prev Page, Zoom In, Zoom Out, Move Up, Move Down or Full Screen. CBR Reader could also read other similar comic format files, such as *.cbz, *.cb7, *.cbt and *.cba files. Note: Run CBRReader.exe to launch CBR Reader Portable. 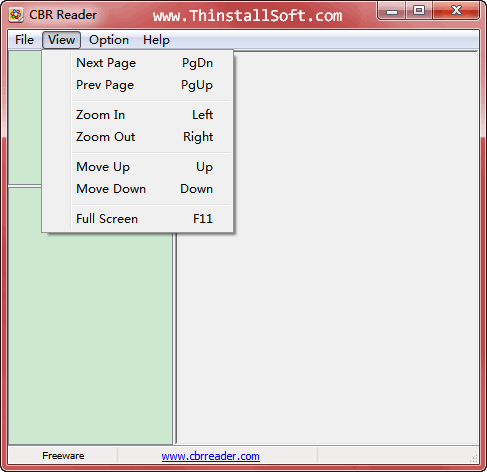 The current version is CBR Reader 1.0. You could also try STDU Viewer Portable, Free Opener Portable or Open Freely Portable to view CBR/CBZ files. This entry was posted in Office & PDF and tagged cb7 reader, cba reader, CBR Reader, cbr reader portable, cbr viewer, cbt reader, cbz reader, cbz viewer, comic book reader, comic book viewer, File Viewer. Bookmark the permalink.